Charming 350 year old period cottage in the pretty North Devon village of Kings Nympton. Somerleigh is a beautiful, traditional village house, fitted with every modern comfort and complete with a hot tub and small gym, and a private, enclosed cottage garden. The house is available for letting in the summer and Christmas and Easter holidays. Somerleigh is a stylish and welcoming family home, full of character and with many original features. It has been tastefully decorated and recently refurbished throughout, with careful thought given to all those little details that make for a perfect holiday. The house has its own home entertainment system, wifi and receives a good mobile signal. The cottage is surprisingly spacious and sleeps eight. It has five bedrooms, with three bathrooms (two ensuite and a family bathroom with roll topped bath, ideal for a luxurious soak). The bedrooms are positioned in three separate areas of the cottage, providing some extra privacy, and making the house particularly good for holidays with extended family or a group of friends. Children always love this house because it has two staircases - perfect for games of Hide and Seek. Downstairs there is a light and airy lounge with a real log burner for cosy winter nights. The dining room, in the oldest part of the cottage, has an original beamed ceiling and inglenook fireplace. (Note to our taller guests – watch your head as the ceiling in this room is just 6’ 2”). In the well-equipped kitchen overlooking the garden you will find everything you need, with a double oven range cooker, separate grill and six gas burners. Also supplied is a washing machine, tumble drier, dishwasher, microwave, fridge-freezer with ice machine and nespresso coffee machine. If you fancy a night off from cooking, it is just a short stroll down the road to the award-winning Grove Inn, a traditional thatched village pub, with a reputation for great food. Kings Nympton also has its own children’s playground for the younger members of your party to enjoy. There’s plenty of things to do for all the family at Somerleigh. Upstairs you will find a games room with ice hockey, mini pool table and football table. There is a widescreen TV and audio equipment in the lounge, and a second TV and DVD player in the ‘Snug’, as well as a toy cupboard full of games and jigsaws. Somerleigh has a delightful cottage garden, ideal for al fresco dining, with patio, table and chairs and barbeque. And of course the luxurious hot tub with spa jets, Jacuzzi bubbles and twinkly lights – a perfect spot for relaxing as the sun goes down. Somerleigh is an excellent base for exploring this fabulous, unspoilt part of Devon. 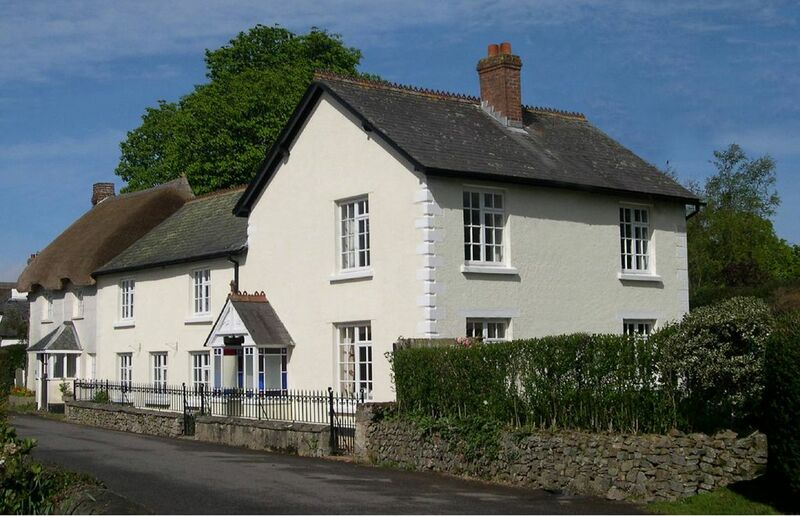 Kings Nympton is one of North Devon’s loveliest villages, surrounding by glorious rolling countryside but just 4 miles from the market town of South Molton, with health centre, supermarkets and large health food store. The village is half an hour’s drive from the world famous surfing beaches of Saunton Sands, Woolacombe, Putsborough and Croyde, where you can experience the invigorating Atlantic waves or simply enjoy building castles in the soft golden sand. Exmoor National Park is also within easy range, with its stunning heather moorland and ancient wooded valleys. Look out for the Exmoor ponies and wild red deer. To the south of Kings Nympton lies Dartmoor National Park, with its granite tors and inspiring open spaces and wide selection of walks to suit all abilities. The ancient Devon capital of Exeter is around an hour away, with its magnificent cathedral and superb shopping facilities. If you would like a day in Exeter without the car, the city can be easily reached via the Tarka Rail Line, boarding the train at Kings Nympton station, 2.5 miles from Somerleigh. When you arrive at the cottage at the start of your holiday you will find a welcome pack and some locally made treats. Fresh clean linen and fluffy towels are provided. The house is managed by a housekeeper who lives nearby and will be happy to help if you have any problems during your stay. We hope very much that Somerleigh will feel like a home from home. We wish you a wonderfully enjoyable and relaxing holiday in this most special part of the South West. This is a lovely cottage and myself and my family had a lovely stay. Absolutely loved the garden. The accommodation was a great size perfect for two families. On arrival we were greeted with a lovely hamper and an extremely lovely cake. Beautiful property with everything you needed for a lovely holiday. The houses is just what need every thing is there for you to enjoy . Hot tub for the night to watch the stars , lovely garden with plenty of garden furniture. Bedrooms are lovely with plenty of space. Down stairs bedroom with shower for elderly people. Would recommend this house for a large family bonus of pub 100yrds down road which does cracking food and real ales. We all had a wonderful, relaxing holiday in your home Somerleigh. The house was excellent and both the children and the adults enjoyed the games room, the hot tub and the delightful garden. The community in the village were friendly and helpful and the pub was an old style pub which served good food. The house had everything we needed and more, obviously a home. It was very well cleaned and all ready for us when we arrived. The welcome hamper was out of this world in fact we had to go and find the chocolate supplier to buy more, and the homemade cake was also lovely. Thank you sharing your lovely home. We had a wonderful, relaxing holiday in Somerleigh. The house was perfect for us all, and we loved wandering around the beautiful village. The hot tub was a favourite activity, especially for our 6 yr old granddaughter, and the house had everything we needed to enjoy ourselves. The welcome hamper was the best we have ever had, and the homemade cake was lovely. It was a lovely, peaceful, friendly village and we would recommend staying here. Thank you to the O'Briens for sharing their lovely home. 8 of us stayed in the cottage for a week and had a fantastic time. The cottage is large enough for all us to have some space if required but able to come together for meals etc. The welcome basket was a fantastic treat, and the cottage was spotlessly clean. There are two TVs and loads of DVDs which allow the children to watch what they want and the adults something else. The kitchen is very well equipped and the beds very comfy. We have stayed in loads of cottages over the years but this is the best by far.